The Hon. 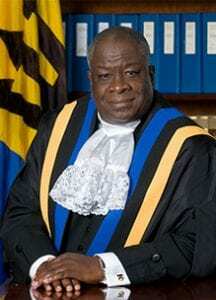 Sir Marston Gibson, K.A., assumed office as the 13th Chief Justice of Barbados on 1 September 2011. Chief Justice Gibson was born on 3 March 1954 and was educated at St. Matthias School, Foundation School and Harrison College. He pursued legal studies at the Cave Hill Campus of the University of the West Indies from 1972 and obtained the Bachelor of Laws (LLB) in 1975. While attending the Hugh Wooding Law School, he lectured in Criminal Law at the Faculty of Law, St. Augustine Campus, University of the West Indies (“UWI”). From 1981 to 1987, he was a lecturer at the Faculty of Law, Cave Hill Campus, UWI, where he taught Criminal Law, the Law of Real Property, Law in Society (Jurisprudence), as well as Equity, Doctrines and Remedies. Chief Justice Gibson emigrated to the United States in 1987. He was admitted to practice law in the State of New York in 1989 and served for 22 years in the New York State Court system. He began in March 1989 as an Appellate Court Attorney from 1989 to 1992, ultimately attaining the position of Principal Appellate Court Attorney. In 1992, he was appointed a Judicial Referee in the Surrogate’s Court, New York County (Manhattan), where he heard cases involving estates and trusts, particularly where there was a need to establish kinship between petitioners and the deceased persons whose estates they were claiming. He served in that Court until 1998, when he transferred to the Supreme Court of New York, Nassau County (Long Island). At the Supreme Court in Nassau County, whose jurisdiction similar to that of the High Court of Barbados, the Chief Justice heard civil cases, and was assigned to the Supreme Court, Matrimonial Center, from 2001 to 2008. He remained there until his appointment as Chief Justice of BBarbados in September 2011. Chief Justice Gibson holds Bar membership in several jurisdictions including Barbados, Antigua and Barbuda, and Trinidad and Tobago. He is also a member of the New York State Bar and is admitted to practise before the United States Supreme Court, as well as the Unites States Federal Courts for the Eastern and Southern Districts of New York. He was an Instructor in the Paralegal programme at Lehman College, City University of New York from 2000 to 2008, where he taught various subjects including Estates, Wills and Trusts, Legal Drafting and Business Law. Chief Justice Gibson is also a musician and plays the guitar, although he prefers the bass guitar. From 1981 until 1987, he was a member of the National Crop-Over Festival Orchestra which supplied accompaniment to the competitors in the Pic-o-de-Crop competition which takes place during the Crop-over Festival in Barbados. He also sings bass in the choir at St. Ambrose Anglican Church, and has been a member of the choir of St. George’s Episcopal Church in Hempstead, New York. His interests do not end there. While at the Surrogate’s Court of New York County and Supreme Court, Nassau County, he was a union delegate (shop steward). He was also Vice President of the Foundation School Alumni Association of New York and is a current member of the Foundation Old Scholars Association of Barbados. He is a member of the Barbados Cancer Association of New York and the Caribbean-America Medical and Scientific Association. From 1984 to 1987, he was the moderator of “Guttaperk”, a call-in radio programme on the Caribbean Broadcasting Corporation, and for over 15 years, he was a member of the St. Matthias’ Scout Troop where he attained his Queen’s Scout Badge. He brings to his job a background of over 32 years of teaching and working in the judiciary, as well as diverse hobbies and interests. On 30 November 2012, as part of the National Independence Honours, Chief Justice Gibson was conferred the Honour of Knight of St. Andrew with the title Sir Marston Gibson, K.A.